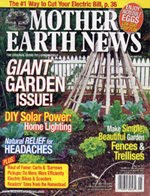 Meeting Cheryl Long, Editor-in-Chief of Mother Earth News, was a true delight! We discussed everything from their pastured-eggs study to new backyard chicken coop designs and from solar panels to wind power. We sampled heirloom herbs from her garden and took a test drive in a new prototype all-electric vehicle. Not only is Cheryl extremely knowledgeable in the realms of natural living and back-to-the-land skills, but she’s also an intelligent, well-spoken individual who is just a pleasure to be around. We shot over 2.5 hours of footage which we’re very excited about perusing back in the editing room.